HIGHFeeL is proud to announce the first tour dates of the Japanese band PLASTICZOOMS for 2017, and the international release of their new album, on January 11. 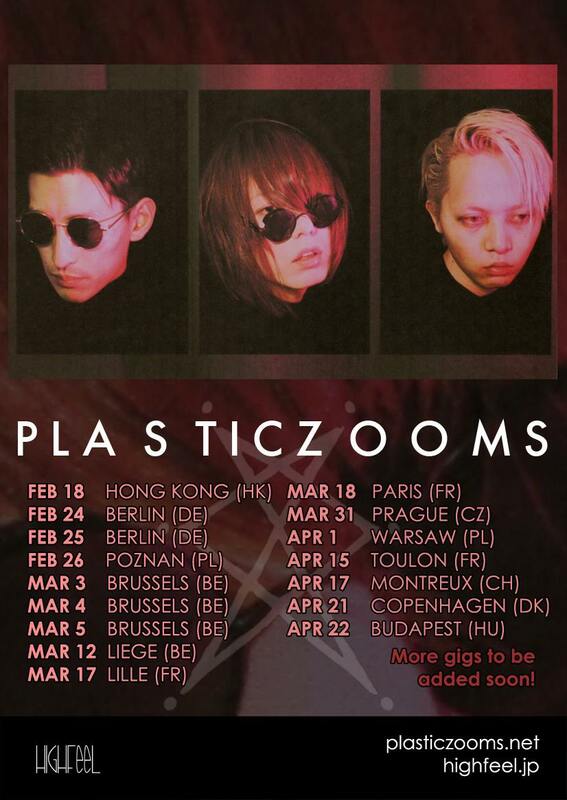 After a first show in Hong Kong, PLASTICZOOMS will kick off the European leg of the tour with two shows in Berlin, their beloved city. All the details regarding venues, guests, time schedule and tickets will be announced within the next weeks. Several shows all over Europe are still pending, and will be confirmed asap. More gigs to be added soon! Combining elements of 70's punk, 80's post-punk, new wave, and gothic genres all into the core of a new sense of sound, they seek to establish themselves in ways beyond precedent in their native Tokyo scene. Frontman Sho Asakawa, in keeping with the spirit of DIY, personally directs and produces their music, artwork, merchandise, and all other creative endeavors. Active since 2007, PLASTICZOOMS could gather a loyal fanbase in their counry and outside. In 2015, they started their international activities. Beginning to gain traction as fashion icons, the members of PLASTICZOOMS were featured models in the magazine THE REALITY SHOW, photographed by Nobuyoshi Araki. Soon after, PLASTICZOOMS collaborated during Tokyo Fashion Week with the trendsetting Japanese fashion company DISCOVERED, producing clothing and providing the soundtrack for the collection through the release of their second album, STARBOW. Additional collaborations around this time included jewelry with accessory brand JAM HOMEMADE and creative exchanges with UK streetwear brand LONG CLOTHING. With the 2013 release of PLASTICZOOMS' third album, CRITICAL FACTOR, they went on to an unprecedented footwear collaboration with Shinya Yamaguchi. 2014/15: TOM was featured as a catalog model for SHINYA YAMAGUCHI. 2016, SHO ASAKAWA appeared as a model for the latest collection of the brand MICHIKO LONDON (Harajuku Laforet Fashion Show). PLASTICZOOMS relocated to Berlin for a year. After having organized several shows in Berlin with local and international artists and DJs, they began their collaboration with the agency HIGHFeeL to release a new and exclusive physical EP (Veiled Eyes) and tour in France, Belgium, The Netherlands, Germany and Poland. In 2017, an international tour of around 20 shows will be organized and produced by HIGHFeeL, to celebrate the release of the brand-new album, “PLASTICZOOMS”.